Ahhh, beloved peanut butter strikes again. I just can't seem to stay away from the stuff! 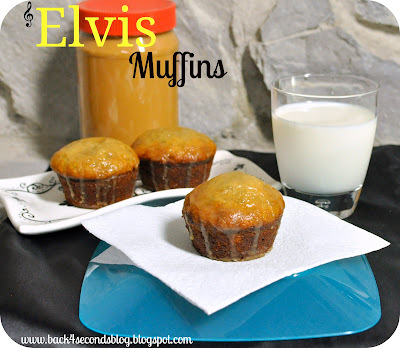 Today I'm sharing a recipe with you that would make Elvis proud. 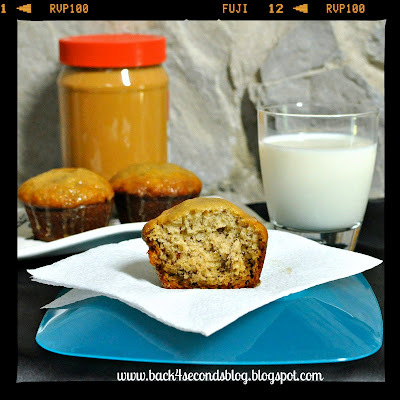 Peanut butter + banana in one glorious muffin. Make these at night for a quick grab and go breakfast or eat them for a mid afternoon pick me up. They are filling and melt in your mouth delicious! I love these! PB + bananas are a favorite of mine! And I am always looking for new muffin recipes!! I. love. banana! These muffins look perf. And PB banana muffins? Even better. Methinks this is dinner, lunch, breakfast, dessert AND snacks. Obvi. Muffins is my favorite! Yummy. Ooh yum! I love peanut butter and banana! What a great breakfast recipe! These are so perfectly named! "Thank you, thank you very much" for sharing! Elvis was my favorite..so these HAVE to be special! Thanks for sharing on Southern Sundays. Hope to see you again soon! Oh my gosh...these look absolutely amazing!!! Thank you so so much for sharing them at our Summer Blog party!!! Mmm this sounds awesome! My little Bean would love this. I'm going to try it out this week, I'll let you know how it goes. New follower from the Show and Tell link up, hope you'll stop by my blog and follow back! I have a feeling these muffins would have the King crooning, "I can't help...falling in love with you."